Although as a company, we are devoted to being the world’s fastest-growing email delivery service, we often touch base with our email marketing folks, too. This blog is dedicated to discussing, the usually non-approachable topic with email marketers – the unsubscribe list. Yes, in theory, it’s looked upon as a negative thing. However, we want to prove why email marketers should appreciate their unsubscribers while also brushing up on some best practices. Rule #1 – You do NOT want uninterested subscribers, it saves time for both sides. Remember, most of the people on your email lists are customers or prospects. Sometimes during the signup process, you gain subscribers that aren’t the right fit, and that’s ok. When someone unsubscribes, it just tidies your list with people who appreciate your content. These are qualified, engaged prospects. Don’t be fooled by having a large email list of subscribers. If you have unqualified subscribers, this will actually damage your open rates. There’s also no point in sending emails to inactive subscribers. This will ruin your inbox deliverability. You want to be able to effectively evaluate your open rate and one way to achieve this is by eliminating the uninterested subscribers. You want to make sure your customers have the option to opt out. You will gain nothing but annoyance from customers who want to unsubscribe but the link is hidden somewhere in the footer. Let’s look at SuperShuttle as a good example. 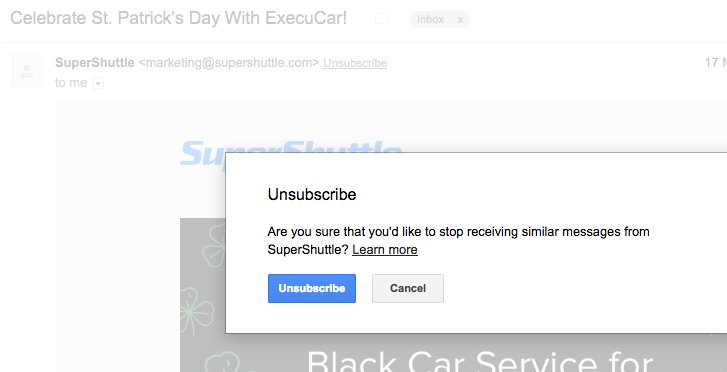 Another reason to make the Unsubscribe Now option more clearly visible is because, often times, customers will mark your mail as spam if there’s no easy way to opt-out. As a commercial email sender, you do not want this. It’s important to appreciate the fact that unsubscribes save your reputation, as they’d otherwise be marked as junk. However, there are ways to deal with spam complaints if they creep up on you, and our deliverability experts have covered these topics extensively. Using Feedback loops (FBLs) for unsubscribes is another way to effectively manage your email marketing strategy. Feedback loops are crucial to be able to unsubscribe a member from your email list. You want to avoid subscribers submitting complaints, which will hurt your overall deliverability. Find out more information on spam from our previous blogs. If you are particularly concerned about your opt-out figures, you can always use different methods to deter your subscribers from leaving. Consider implementing an email preference center and give the customer the option to manage their subscription settings. This is a win-win for you and the customer because they receive the emails they want, or opt-out completely. Plus, you receive more information about the customer’s interests. You want to ensure that your customers do not feel suffocated and instead build a healthy relationship and association with your brand. If you take nothing away from this post, you should hone in on this point. Unsubscribers bring to light a company’s churn rate. Your churn rate is the percentage of how many subscribers leave your list at any given period of time. You can look at it as transparent churn (they voluntary unsubscribed) or opaque churn (they are failing to see your emails). List churn can make up as much as 25% of your list every year. It’s an efficient way for email marketers to re-evaluate their engagement with subscribers. If you want to calculate your own churn rate, you can do it here. When a recipient says bye, it doesn’t have to mean forever. Let’s say the unsubscriber quite simply gets to the unsubscribe page and follows through. This is your chance to promote your social media pages. Perhaps some subscribers want to clear their inbox, but they’re happy to spot the occasional Tweet or Facebook post. Remember, all these tricks are ways to discover more information about your audience. No matter what, make sure to ask your customers why they’re leaving. This is not a mechanism to make them stay, rather a way for you to collect feedback on your list building process overall. Did they sign up by mistake? Did they sign up at all? Or were the emails just no longer relevant to them? You can gain really valuable insights on your email marketing strategy from your unsubscribers, so make sure to capitalize on the why. If you have any questions on this topic, feel free to contact us via our Twitter or Facebook, or comment below.